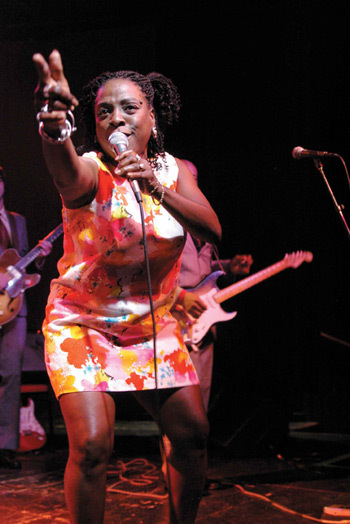 Born in Augusta and raised between Georgia and New York, Sharon Jones grew up on soul’s golden era of the Sixties and Seventies. Half a generation younger than funky divas like Lyn Collins and Marva Whitney, Jones figured her moment had passed once R&B moved from juke joints to discotheques. That was until 1996, when a group of local New York soul/funk players needed a vocalist. Jones figured she had nothing to lose. That band, the Soul Providers, eventually evolved into Sharon Jones and the Dap-Kings, whose previous albums, Dap Dippin’ (2002) and Naturally (2005), anchor the Brooklyn-based Daptone Records label. They are now preparing their yet-unnamed third album, due out this fall. Jones and the Dap-Kings have shaped a “retro-soul” aesthetic that nods to the Southern sounds of Memphis, Muscle Shoals and New Orleans, transforming 30 years of R&B and funk traditions into a synergistic blend of soul styles. Once treated as curiosities, they’ve become pioneers among artists ranging from Finland’s Nicole Willis and the Soul Investigators to vintage vocalist Spanky Wilson and the Quantic Soul Orchestra. Britain’s charmingly coarse singer/songwriter Amy Winehouse recorded with the Dap-Kings on her recently released Back to Black album. As a soul singer in her 50s at the start of her career, Jones would seem a woman out of pace with time. If anything, she now seems a few steps ahead. Stop Smiling: As someone who was born in James Brown’s hometown and raised on his music, what did his passing mean to you? Sharon Jones: When I was coming up, I didn’t make it in the music field because they told me I didn’t have the look. Until James Brown came out with “Say It Loud, I’m Black and I’m Proud,” I used to hate it when people called me dark-skinned. When that song came out, no one could say nothing to me. I was like, “You darn right I’m dark-skinned. That’s right, I’m black and I’m proud.” It made me look at my life differently. God gave me this gift — this voice — and people will one day accept me for who I am. I’m a proud black woman. It took his death to make me realize that. SS: Growing up in both New York and Georgia, did you have any particular affinity for a regional soul style, like Detroit’s Motown or Stax in Memphis? SJ: In 1966, I was like 10 years old. We listened to AM radio and didn’t even have FM. When I turned on the radio, we heard everything from the Beatles to Otis Redding, James Brown to Aretha Franklin and Elvis. I think I was more into Motown since I was on this side of the country. SS: That’s interesting since your music has the kind of grit and earthiness people tend to associate with Southern soul, as opposed to Motown’s more pop polish. SJ: That influence is from the JBs, James Brown, Dyke and the Blazers. That’s what we built it on — that style from the late Sixties and early Seventies. SS: Are you surprised to see more folks — let alone 20-something, white British singers like Amy Winehouse and Joss Stone — pick up on what the Dap-Kings have helped craft? SJ: We’ve been out here for the last 11 years. Then we went to London and there was a craze about this music. We started this thing. A lot of those artists have heard us over the years and now they want it. I’ll say that to anyone’s face. They can’t deny it. That’s why Amy Winehouse had to get the Dap-Kings. SS: On one hand, you must feel vindicated. When you all first started, some critics treated your records as a throwback fad. SJ: Pretty soon they’re going to give out awards for this. We won’t be recognized, because we’re so-called underground music. But I don’t see anything underground about what we’re doing. They can get some of the younger people with a certain look. They can put them on TV, and a lot more people will hear this music. It boils down, again, to “I don’t have a look.” Amy Winehouse, she’s young. Put me in her place 30 years ago, and there’s no way I would be back here. But I’m hanging in there. I know what I’m doing, and I feel whatever is going on this year, I started 11 years ago. I’m going to keep on going until I can’t go anymore. When I tell people I’m just beginning, they’re like, “How can you just be beginning at 50?” I’m new at this. I’ve been crawling. Right now I’m just standing up. I’m taking my first couple of steps. SS: Before your musical career took off, what were you doing for a living? SJ: At that time, I was working at Riker’s Island, guarding prison inmates. I was a corrections officer. In between that, I was working with a wedding band called Good and Plenty. I was with the wedding band for almost 18 years. SS: When did you last perform at a wedding? SJ: Actually, people hire the Dap-Kings to perform at weddings. Before Christmas, a couple flew us up to Maine and gave away our CDs to all their family. SS: Do you have to play songs like “Celebration” and “YMCA”? SJ: We do our set. I tell them, “We’re not doing covers. If you’re going to hire us, we’re going to do what we do.” We did do a couple Otis Redding songs as openers. SS: Since that wedding gig, you haven’t done too many shows, especially since the Dap-Kings are touring with Amy Winehouse right now. Is it tough being at home since you spend so much time on the road? SJ: In January I was in Australia with Lou Reed, but I haven’t been with the Dap-Kings in a while. When I don’t perform with them for over a month, I get crazy. I’m going to be 51. I’m getting too old for this. Like a rusty cat — my bones get stiff. I got to stay on the stage to keep the joints moving.